Click HERE to view and shop the clearance rack in my online store. Among the many bargains are these two Christmas punches. These won't last long so get in quick before they sell out! Faux Patina Technique. Love this vintage stamping technique. Hello friends. Those that follow my blog know I love all things vintage, so this Faux Patina technique is one of my favourites. It's really easy to achieve and gives a WOW effect, You can download a free step by step technique sheet at the bottom of this post. I love the little shine of gold that is added in with the mixed colours. This was one of my club projects from last year, so some of the products have retired, but I would now substitute Coastal Cabana for the Baja Breeze and any vintage style embossing folder will give a similar effect. Another tip for a vintage look is to stamp your greeting onto vintage style paper, instead of cardstock. In this instance I have embossed the greeting in Early Espresso onto First Edition DSP. Would you Like to Get Materials for 3 Free Projects a Month from Me? That's what my stamp club by mail customers get! A lovely package in the mail each month with cardstock, paper, die cuts and embellishments to make 3 projects each month. They also get to choose $50 of free products (and can choose from the hostess only sections in the catalogue). 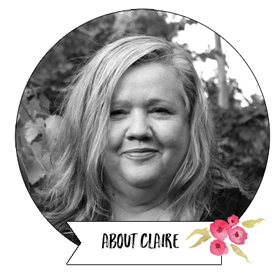 Find out more and sign up for my new February clubs HERE (Australian residents only). 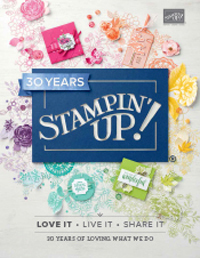 Clearance Rack sale starts midnight tonight - up to 80% off Stampin' Up! 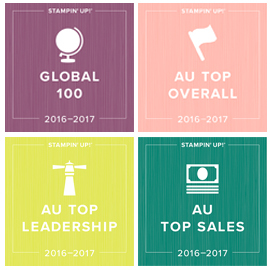 If you live in Australia and want some bargains on Stampin' Up!, check out the Clearance rack sale tonight. Soon after midnight AEST, click on the link to my online store (or click on the red button in the top right hand corner) and there should be details of the Clearance Sale. I'll also update the information here on my blog when it's available. Click here to access my online store. Stampin' Up! Festive Flurry card and matching ornament. Nothing quite says festive like a bit of bling does it? The Festive Flurry bundle is perfect for making beautiful cards and ornaments, like this matching set I have made in Rich Razzleberry, Gumball Green with silver glimmer paper and embossing. The greeting is from Joyful Christmas. The cute little Frosted Finishes embellishments finish the card off nicely don't you think? Here is the matching ornament using Stampin' Up! 's heart and Bird Builder punch. My Stampin' Up! club 'by mail' ladies got to make 3 different ornaments this month with the free tutorial and materials I posted to them for their free monthly class. If you are interested in receiving a free monthly class of 3 projects from me which you can make at home, check out my clubs. Next ones start in early February 2014. You can participate from anywhere in Australia and all the details are HERE. 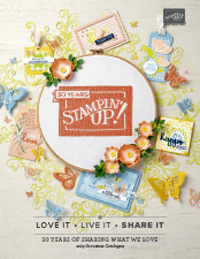 Here's a look at some of the Stampin' Up! supplies I used to make these. Silver Embossing Powder (View here in the online store). You require Versamark ink and a heat gun to use this).